For years, signs have pointed to an association between Alzheimer’s and diabetes. As the American Diabetes Association reported, the metabolic condition is particularly prevalent among older adults, with some 11.8 million seniors – about 26 percent – suffering from diagnosed or undiagnosed diabetes or pre-diabetes. As the Alzheimer’s Association states, research into the field has shown that those who have the blood-sugar disorder tend to experience decreased cognitive function. Such findings have prompted scientists to delve further into the field and investigate the relationship between Alzheimer’s and diabetes. A September 2014 report from Alzheimer’s Disease International explores potential modifiable risk factors of dementia in four main categories: developmental, psychosocial and psychological, cardiovascular and lifestyle conditions. The King’s College London researchers who conducted the study found that controlling high blood pressure levels and diabetes as well as reducing cardiovascular issues had the potential to reduce the risk of dementia. In fact, diabetes was shown to increase the chances of developing dementia by a whopping 50 percent. They noted the need for greater public awareness of obesity and low levels of physical activity, which are epidemic throughout the U.S., as these are major risk factors for hypertension and diabetes. As the study states, people may reduce their chances of developing the cognitive condition by modifying their lifestyles and and taking on heart-healthy habits. What do these findings mean for seniors with Alzheimer’s? For seniors with Alzheimer’s, this may provide insight into just why so many people with dementia are also afflicted by diabetes. In such cases, older adults require special attention and medical regimens to keep their blood sugar levels balanced, and as the study suggested, doing so may help seniors retain and recover cognitive function. 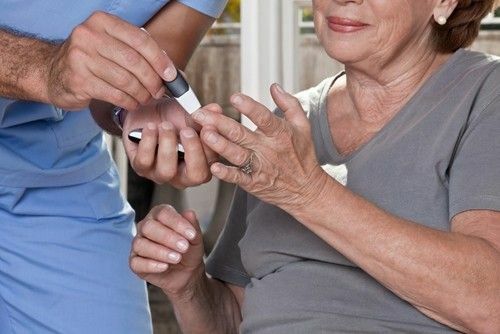 Fortunately, Aegis Living provides specialized care for people with secondary conditions including diabetes. The full time-nursing staff at these communities are dedicated to helping seniors comply with insulin and other medication regimens, and specialty diets help seniors with diabetes keep their blood-sugar levels intact.